Back in the summer of 2012, many fans were excited to learn about the release of Junsu’s (XIA‘s) new English single album, “Uncommitted.” The album opened a new understanding towards the singer’s ability to digest and express different musical ranges. Many have wondered about the American producer behind the English song “Uncommitted”. 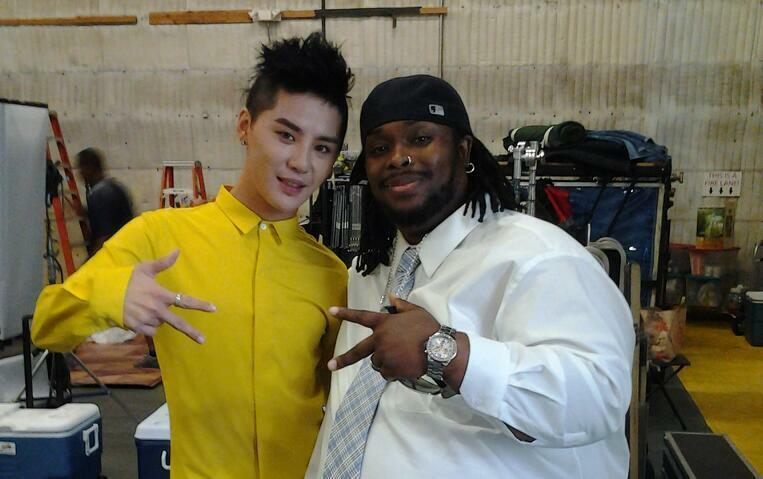 The question might have occurred again this past summer, when the same producer of “Uncommitted” had worked with Junsu to create the song “Incredible,” the Korean and English title song featuring Quincy Brown in Junsu’s second solo album. 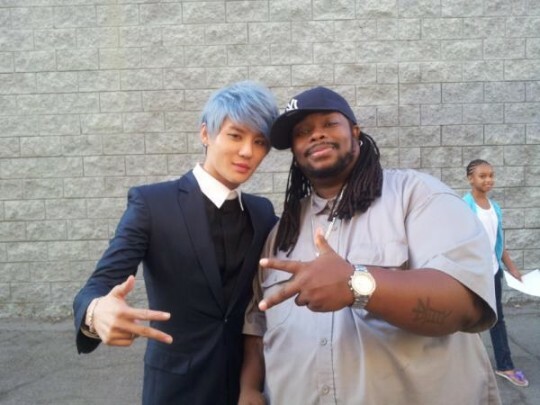 American producer Bruce “Automatic” Vanderveer, CEO of InRage Entertainment, is the mastermind behind “Uncommitted” and “Incredible,” two completely opposite styled songs that managed to fit perfectly with Junsu’s vocals. While “Uncommitted” will make you shed tears as you grasp the heart-wrenching lyrics, “Incredible” will make you throw away the tear-moistened tissue as you dance along to the upbeat rhythm. Despite his busy schedule, I had the opportunity to interview producer Bruce “Automatic” in obtaining the exclusive scope of what it was like to work with Junsu, as well as what the processes of creating two incredible hit songs entailed when working in the realm of K-Pop as an American music producer. Having worked with world famous singers such as Michael Jackson and Christina Aguilera, producer “Automatic” provides a musical perspective to K-Pop that leads the way for Korean pop to be identified as a world renowned genre. I.Said.Hi: It’s a pleasure to have this interview with you! Bruce “Automatic” Vanderveer: Hi! Awesome, I’ve been waiting for your call. I’m here at the studio right now. I: I just have some questions for you that I know our readers are curious about. So, let’s get started! First off, you’ve worked with Junsu twice now, producing both “Uncommitted” and “Incredible.” Let’s go back to the beginning. How did this relationship form? B: C-JeS actually contacted me. It was a very unique situation. They had an independent A&R (Artist and Repertoire) person named Niddy who was reaching out to different producers. He asked me if I could contribute any songs for Junsu’s album, but I didn’t know who Junsu was. My daughter knew who he was and she was so excited to hear that Junsu wanted new material. I have worked with Pink, Christina Aguilera, and so many other acts, but I’ve never worked with anyone in K-Pop. But my daughter was into JYJ, BIG BANG, TVXQ, G-Dragon, EXO, and all these different groups. She convinced me, and I submitted many songs. Junsu chose “Uncommitted,” but “Uncommitted” was a song I wrote four years ago, so I didn’t really think he would take the song. It was a good song, but I didn’t think he would choose it. I was so surprised when he chose it. I: Well, I know that many readers are curious about your experiences working with Junsu. What was it like to work with him? Do you have any funny or interesting episodes while working with him? 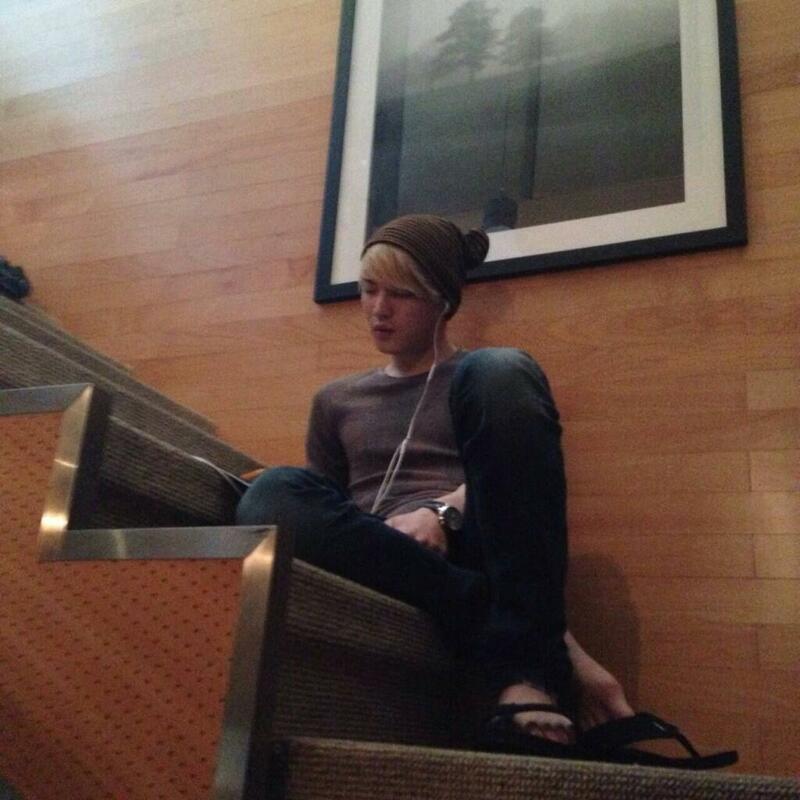 B: Junsu, when he is in a creative environment, is relaxed and so funny. He’s just a really down-to-earth guy. When we were recording “Incredible,” we were trying to help him re-cut some of the Korean parts, and I was trying my best to pronounce Korean. So sometimes, he would start laughing at my pronunciation. We were joking all the time. After we would do a take or two, he would start practicing Korean with me. I: Do you remember any of the Korean words or phrases you learned? B: ‘Anyeonghasaeyo’ (‘Hello’ in Korean) is all that I’ve got so far [laughs], but we are making it important to start learning Korean. The fact that we have so many fans in Korea and all around the world makes us want to start learning. I: Since “Uncommitted” was sung in English, what was the process like to produce an English song for a Korean singer? B: My partner, Ebony Cunningham, is the one who guided him through the English lyrics of “Uncommitted.” She really helped him with the sounds and vowels, and also helped him with the American dialect. Junsu is such a fast learner, and it was really amazing because he was able to capture Ebony’s pronunciation very quickly. Also in the studio at the time was the CEO of C-JeS, Mr Baek (Baek Chang Joo). Mr. Baek was sitting there and also learning the English lyrics. It was a great feeling and vibe because this was the first time we were working with Junsu, and we were all feeding off of each other. Junsu was being a little shy when trying to pronounce the English, but we were all applauding in the studio saying, “You got it, you got it!” It was just a real great cultural experience between people who were learning to communicate with each other. Junsu was a real warm person, so he made us feel comfortable right away. 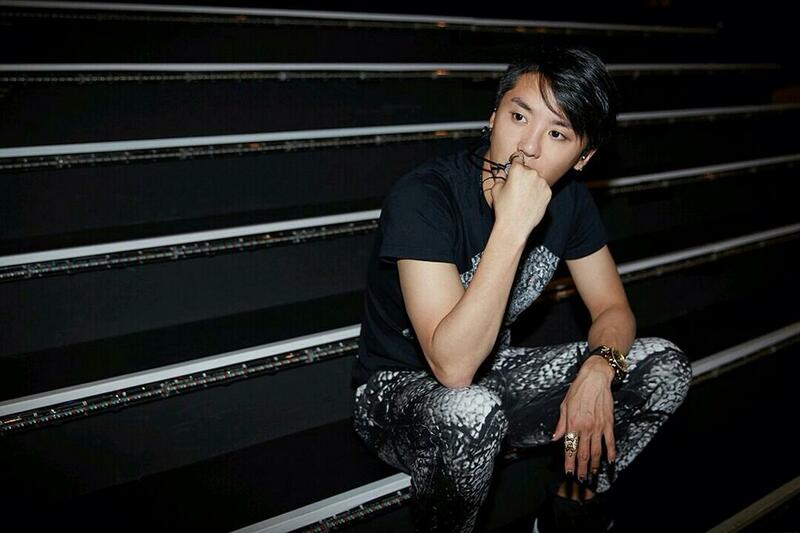 I: Then how was it like working with Junsu when producing “Incredible,” since the song is in both Korean and English? B: What’s interesting is that we wrote “Incredible” and played it for Junsu the day we were recording “Uncommitted.” Junsu, for the year that he had been (promoting) “Uncommitted,” he would say or tweet certain things that gave us a clue that he still remembered the song. So he contacted us and let us know that he wanted to do the song and also translate some of the song into Korean. That’s when Junsu got involved in re-creating some of the lyrics. His writing ability is awesome. Through the Korean lyrics, he was able to not only translate the lyrics into Korean but add more dimension to the song; the lyrics became more beautiful. This is our first collaboration that we wrote together, and we are intending on doing more. When releasing the video for “Incredible,” we sat and talked, and he was teaching me more Korean. I call him my Korean teacher [laughs]. He was saying that he’s looking forward to doing more songs together and was telling me to start working on it now. He works so hard, because here he is recording the video for “Incredible,” and we are talking about the next song. He’s always thinking in advance. I: For the next song, what kind of music styles would you like to produce for Junsu? B: The next couple of things we are going to do with Junsu are going to be a hybrid of different styles of music. I play certain instruments, so one of the advantages we have is to produce music of many different genres and styles. Junsu is one of the most versatile singers I have heard. He could sing in any genre. The next collaboration we work on is going to surprise a lot of people because it’s going to be different genres mixed with popular music, pop. It’s going to be very exciting. I: Now that you have experienced both Korean and American music cultures, what are the traits of K-Pop that you find unique? B: One of the things I love about K-Pop music is that it incorporates a lot of true musical styles that a lot of the times in America we don’t do any more. The stuff I produce in America is very technical and very advanced, but sometimes chord structure is not important as stylization and swagger. But a lot of K-Pop music I listen to really love strong chords, beautiful changes, and good lyrical content, so it helps me explore. As a producer who produced so many different genres K-Pop satisfies my artistic needs. A lot of times, I produce songs that don’t have a lot of chord changes, and its more focused on vocals. Yet in K-Pop, a lot of the songs I listen to are challenging because you can play it on the piano and on the guitar. It’s really beautiful, and I want to help expand K-Pop music in America so that this becomes a part of American culture and music. You know, I got the interview for Junsu with the Grammys and he was on the front page of Grammys.com. The interview was through a friend of mine associated with the Grammys. I’m hoping that eventually the Grammys would start to recognize K-pop. They do have a world music category, but I want K-pop to have their own category. I: Speaking of K-Pop awareness in American culture, we’ve seen the difficulties of big name K-Pop artists trying to break in to the American music industry. As an accomplished and experienced American music producer, what are some advice you would give to K-Pop singers trying to make it in the American Music Industry? B: It’s important to plant seeds. As I listen to more K-pop, the artists seem to incorporate English in their work. G-Dragon did a collaboration with Missy Elliot. If we could continue to incorporate English in to K-Pop, and also try to do as many collaborations with established American artists, it would eventually break down those barriers. PSY has definitely helped to break down many barriers. When we have singers like Junsu who is more of a vocalist, I think Americans would understand that there are many dimensions to K-Pop artists. So we planted the seed because Junsu was the very first K-Pop artist to be on the Grammys (website). We worked real hard to have that happen, and we are going to keep on doing that, keep planting seeds, and help break some grounds. I: As a producer and the CEO of InRage Entertainment, You were able to work with many different people from different backgrounds and cultures. Is there any other area of music that you have yet to venture and would love to challenge? B: It’s funny that you mention it because my first Top Ten record was a country record with an artist name Bettina Bush. She was on “American Idol,” and (the album) was number two on the Hot Singles Sales. That was really ground breaking because I’m an African American from Brooklyn, New York. It seems like my career has been frequently crossing these cultural boundaries. K-Pop came by almost an accident, and now for me to be one of the American pioneers for K-pop is just a cool thing. I’m so honored to be a part of this. I would love to venture out to J-Pop as well. I am also part of a rock band called “Asphalt Messiah,” and again, I’m a black guy doing rock. So we keep doing things that are a bit unorthodox. The next thing we do with Junsu and hopefully with JYJ will be unique. I: Finally, to wrap things up, what is your big vision for InRage Entertainment, and how is K-Pop included in the vision? B: InRage Entertainment’s core value is that we believe in artistic freedom, and we also believe in cultural togetherness. That’s what we’re all about. We have a very strong vision for the future of music and for the future of film. We have on our team a couple of Korean executives who are part of InRage entertainment, and we are working on some new acts. We are going to be putting together our own K-Pop acts. We are preparing a solo female artist and a group, and these people are coming from both Korea and America. We want to continue expanding K-Pop’s appeal, and try to gather a whole bunch of different K-Pop concepts so we can continue pushing K-Pop in to the American music industry. We’re still trying to get it together right now, but we’ve got some awesome things prepared. Also, the result of doing KCON was that a lot of people have asked to collaborate with us.We plan on returning those people’s calls and trying to do more music. Lately, we have been producing a lot of K-Pop music, and we also have people translating for us, getting it ready for us to play for other K-Pop artists. We truly want to work with BIG BANG, G-Dragon, EXO, and all the other artists out there. That’s our goal. I: Thank you so much for your time and sharing with us the processes of producing music with Junsu. We hope to (and we know we will) hear more from you soon. Thanks Bruce! Be sure to follow Producer Bruce “Automatic” Vanderveer’s Twitter and Facebook for the latest updates. 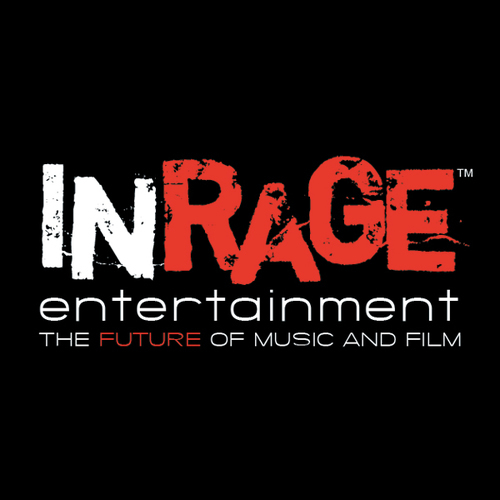 Also, don’t forget to check out InRage Entertainment’s website for more information! The excitement for JYJ’s Kim Junsu (XIA)’s second album Asia tour is hotter than ever. XIA Junsu will be holding the grand finale of his Asia tour from tomorrow till Wednesday at the Yokohama Arena in Japan. Having already kicked of his first Japanese tour as a solo singer, JYJ’s XIA Junsu has already held three successful concerts in Nagoya. Meanwhile, XIA Junsu will be marking the end of his Asia tour at the Yokohama Arena for the next three days and will soon return to Korea to begin rehearsing for the musical ‘December: The Song That Hasn’t Ended’, which will make its debut in December. 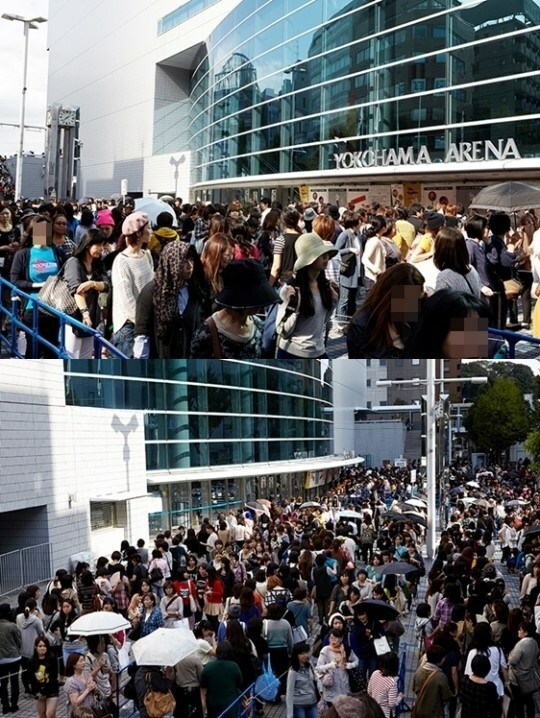 A total of 150,000 people swarmed in to grab tickets for JYJ Junsu (XIA)’s Nagoya and Yokohama concerts. 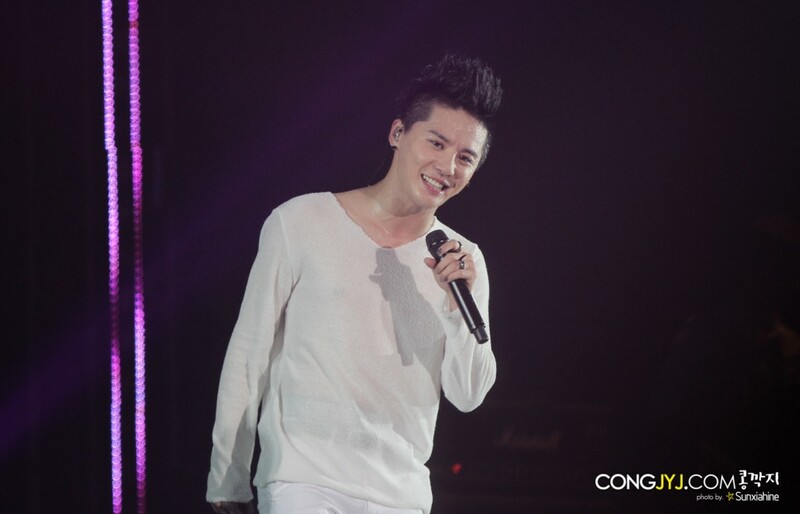 XIA Junsu’s second solo album was released in July and was praised as a “top quality album”. The album’s title song ‘Incredible’ topped the dance track iTunes charts in eight countries, including Japan, Hong Kong and Singapore as soon as the album was released. It also topped Japan’s Tower Records Charts, and Yinyue Tai’s weekly charts, proving that the singer is receiving a staggering amount of love from both Korea and the world. 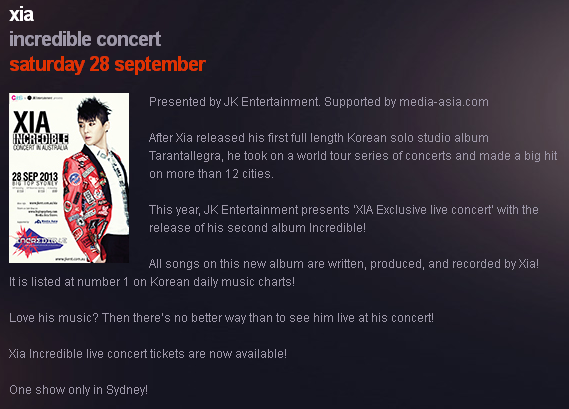 Meanwhile, Junsu kicked off his Asia Tour with the release of his second solo album. Starting in Bangkok, Thailand on the 20th of July, he has performed in Shanghai, Seoul and Busan, and is now preparing for his concert in Australia on the 28th of September and his Japanese tour. 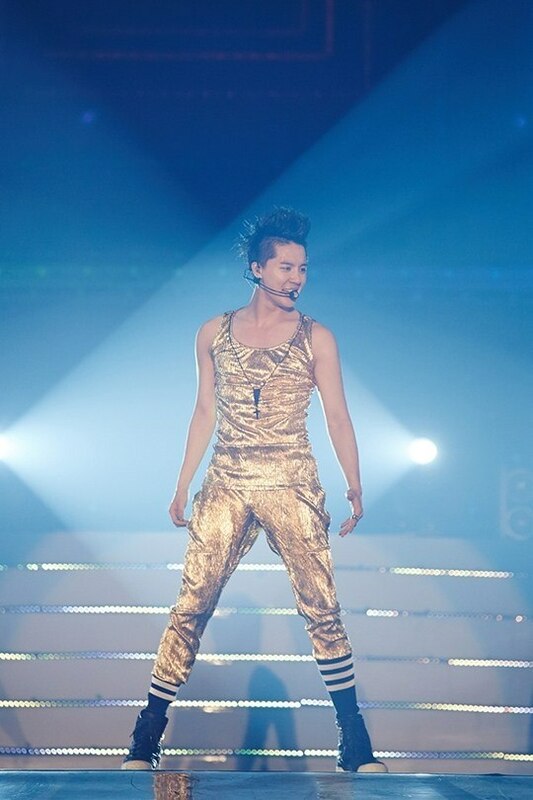 JYJ’s Kim Junsu (XIA) is confirmed to hold a solo concert in Japan in October. According to the representative, Kim Junsu will perform in Australia on the 28th of September and then at the Nippon Gaishi Hall in Nagoya from the 8th till the 10th of October, and then at the Yokohama Arena from the 14th till the 16th. Since releasing his second solo album, Kim Junsu has traveled to Bangkok (Thailand), Shanghai (China), Seoul and Busan (both in Korea) and performed for 40,000 fans across these four cities. 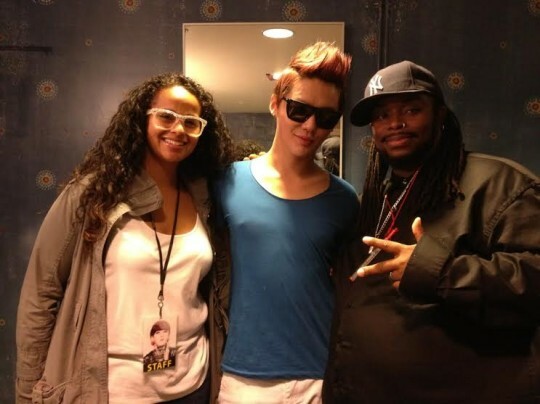 Kim Junsu’s tours have been praised for mixing dance tracks, ballads and R&B together with a large-scale, dynamic stage. We would like to thank all the fans for the support they gave to the XIA 2nd ASIA TOUR INCREDIBLE IN BUSAN concerts. We have taken into consideration the opinion of those sitting in the first row of R Areas 3, 4, 5 and 6 of the August 10th (Sat) concert that was held at BEXCO in Busan, and we would like to notify those involved of a refund policy we have implemented. We will be giving a 50% refund to the fans sitting in the first row of R areas at the Saturday concert who fit the requirements stated below. However, people who bought their tickets from someone else or who changed their seats to a different area on the day of the concert will not be able to receive a refund. The requirements for getting a refund are 1. the ticket number 2. the name of the ticket holder 3. the bank account of the ticket holder, and this information must be e-mailed to the C-JeS webmaster e-mail address (webmaster@cjes.co.kr). We would like to give our apologies for inconveniencing fans with a change in the seating arrangements at the Busan concerts, and we promise to listen more closely to and reflect the opinions of fans to create a better concert experience in the future. 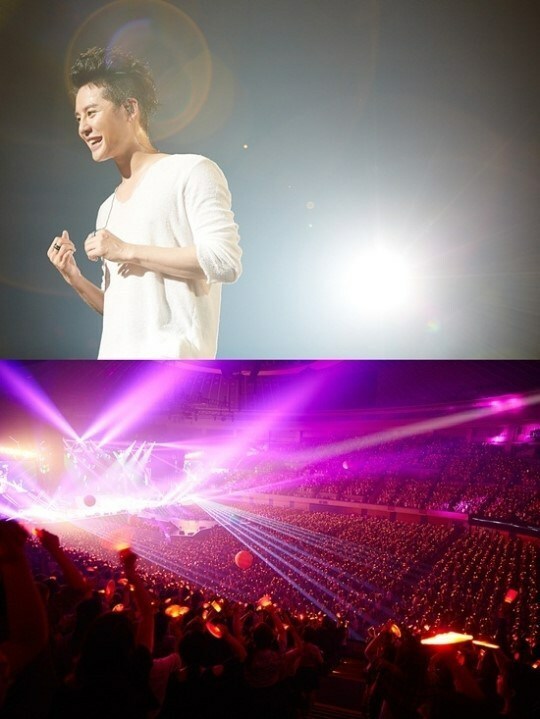 JYJ’s Kim Junsu has completed the fourth leg of his Asia tour in success. This latest tour was named ‘XIA 2nd ASIA TOUR in BUSAN’. The day’s performance was composed of a setlist containing songs from his first and second album, as well as his OST songs. Kim Junsu performed heart-wrenching ballads such as ‘Sorry’, ‘Don’t Go’, and ‘Love is like a Snowflake’, as well as explosive and energetic songs such as ‘Turn it up’, ‘Incredible’ and ‘Fantasy’ with Jeri Slaughter’s dance crew to create the perfect concert. During ‘Genie Time’, when Kim Junsu granted his fans’ wishes, he sang ‘Golden Star’ from the musical ‘Mozart!’, as well as first part of ‘Cherry Blossom Ending’. The most special wish an encore of ‘Incredible’. 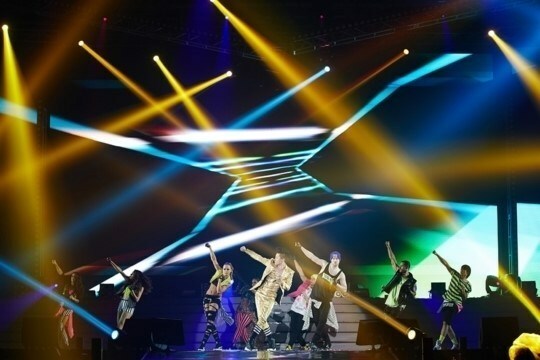 The fan had fallen in love with the upbeat rhythm and powerful choreography that had everyone in the venue getting up to dance, and Kim Junsu got back on stage after the concert was over to perform the song a second time. Meanwhile, Kim Junsu will now be returning to the stage as a musical actor for the musical ‘Elisabeth’. He plans to kick off the second part of his tour in Sydney, Australia on the 28th of September.